It is November 1520 and the Danish king, Christian II, has just been crowned king of Sweden, thereby achieving his ambition to control all of Scandinavia. But trouble lies ahead – the Swedes aren’t willing to accept Danish rule and are prepared to rebel as many times as it takes to dispel their foreign overlords. Christian II had watched his father conquer Stockholm in 1497, only to lose it to the rebel forces five years later. When his father died in 1513, Christian II was ready to pick up from where his father had left off: he was to become the ruler of Scandinavia by any means necessary. For some reason the Swedes didn’t like Christian much either and refused to accept him as king of Sweden. Danish troops were sent to Sweden to force the troublemakers to obey, but were met by a large number of dissident Swedish forces, united behind the lord protector, Steen Sture. Christian II was to prove himself as ruthless as he was dishonest towards his Swedish adversaries. In the autumn of 1518, he proved his sneakiness by breaking a gentleman’s agreement regarding Swedish hostages. The six hostages belonged to the Swedish elite and had been handed over to the Danes as collateral. Instead of keeping his end of the deal and returning them, the Danish king sailed the hostages to Denmark and threw them in jail. Little did he know that the decision, and others, would come back to haunt him. Christian II continued trying to assert his royal dignity over Sture, but without success. So he decided to declare war against Sweden in January 1520. The Swedish forces were dealt a huge blow as Sture was killed in battle barely one month into the war. By the beginning of the summer, all of Sweden except Stockholm was conquered. In September, the city surrendered after Christian II offered all its citizens amnesty. On 4 November 1520, Christian II was crowned king of Sweden in Stockholm’s massive cathedral in the heart of the city, and days of celebration followed. Little did the people know that Christian was planning brutal revenge against those who had opposed him. On the third night of the celebrations, as the clock struck 1am, the music stopped and the doors were shut – effectively trapping all the guests in the great hall. King Christian and his vengeful side-kick, Bishop Gustav Trolle, appeared. The Danish-friendly bishop had been removed from his post and tortured by Sture’s Swedish followers and therefore couldn’t wait to get his revenge. King Christian had granted Sture’s followers complete amnesty when they surrendered two months earlier, but he was not going to let that stop him. As the Swedish elite stood packed in the great hall confused and horrorstruck in their finest evening wear, Bishop Gustav Trolle read out a statement accusing Sture’s followers of heresy – which conveniently made it possible to execute them with the Pope’s blessing despite the promise of amnesty. The followers of Sture, who had imprisoned and abused the bishop, were now sentenced to death by a panel of judges led by … Bishop Trolle. And the next day, many of Sture’s other followers were also condemned to death. During the afternoon of November 8, the executions started with the decapitation of two bishops in the main square in Stockholm. Martial law had been imposed and the streets were therefore deserted, but a witness has described how the blood flowed down the gutter from the main square. That afternoon 82 heads were separated from their bodies, and the bodies were piled up as the blood swam down the streets. The bodies were then transported to a different part of the city and piled in three heaps: one for the clergy, one for the noblemen and one for the bourgeois. 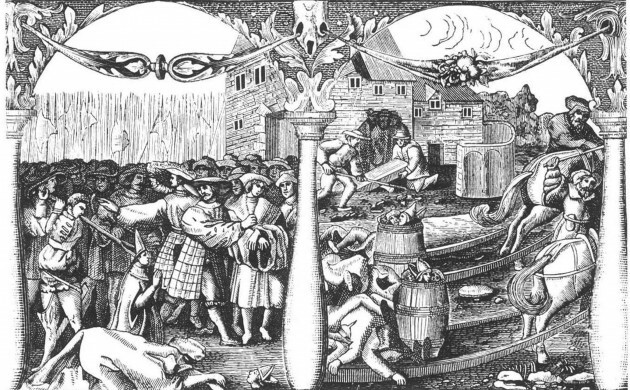 For the grand finale, Sture’s body was dug up and thrown on the noblemen’s pile after which the many bodies were torched. Following that, King Christian hosted another party – this time in the main square where the executions had taken place. When a Swede by the name of Gustav Eriksson heard the news, he immediately packed his bags, vowing not to return home until he had got rid of the Danes once and for all. Not only had his father been killed and his mother and sisters jailed, he was also one of the six Swedish hostages who had been set up by Christian II two years earlier. He had managed to escape Danish incarceration and now the time had come to rise against the Danish tyrant. Soon Eriksson – or Gustav Vasa as he would be known in the centuries to come – gathered 400 men, primarily peasants, who had been pushed too far by the Danish king. The militia made their way through Sweden killing Danish bailiffs and grew in strength and numbers until they reached Stockholm in the autumn of 1521. A siege ensued and was bolstered by a reinforcement of 900 mercenaries, who arrived in May 1522 from Lübeck in Germany. Nevertheless, the Danes held their position in Stockholm for more than another year before finally surrendering in June 1523.